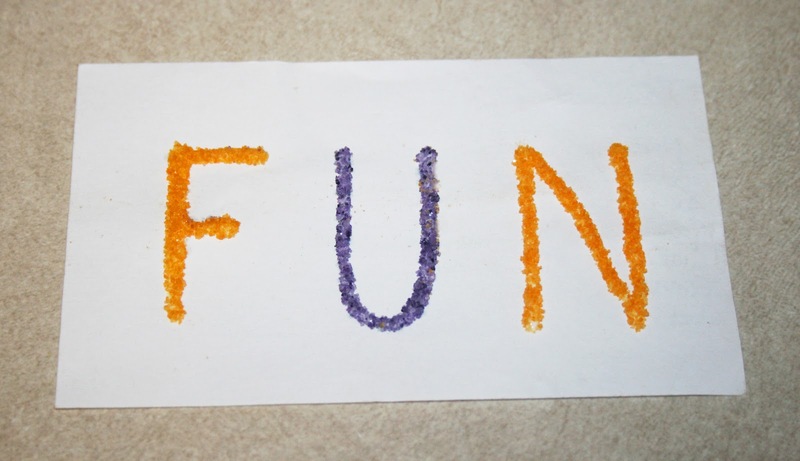 Glitter is fun. It has a way of bringing me back to my childhood. Lots of ooey gooey globs of blue. Glitter sparkles EVERYWHERE. Makes me think of simpler times. I haven't used glitter in many many years. I've used glitter pens, but not glitter. So I don't have any laying around my house. But, I got in the mood to use glitter recently. There's just something about turning plain glue into fun festive colours. So when I saw this project, using only ingredients that I (and pretty much every other American) already has in their house, I decided to try it out. It's very simple. Preheat the oven 350 degrees F. Pour salt into a small bowl. 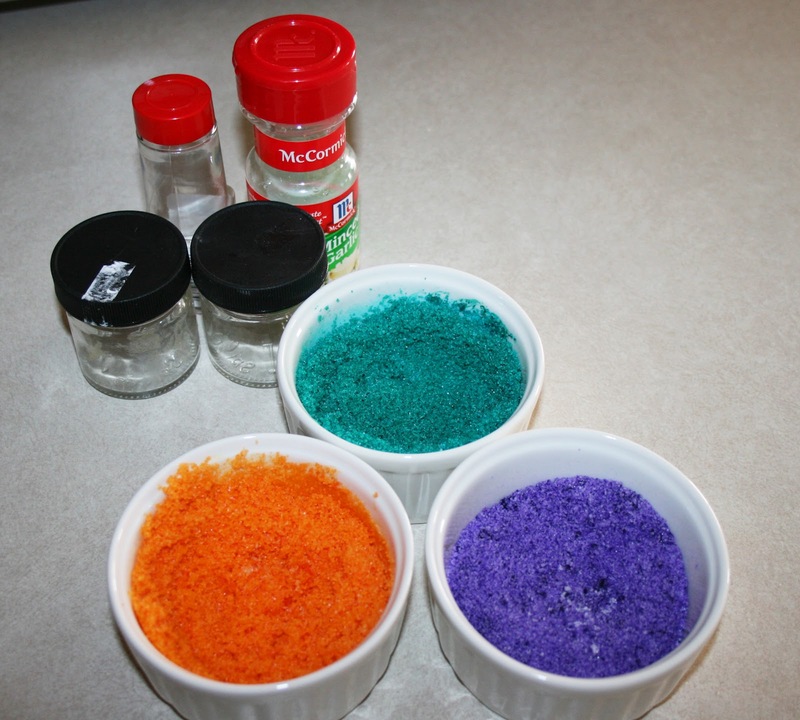 Mix the food colouring in with the salt until it is evenly coated. Line the baking sheet with a layer of aluminum foil. Pour the coloured salt on the aluminum, and spread evenly. Bake for 10 minutes. 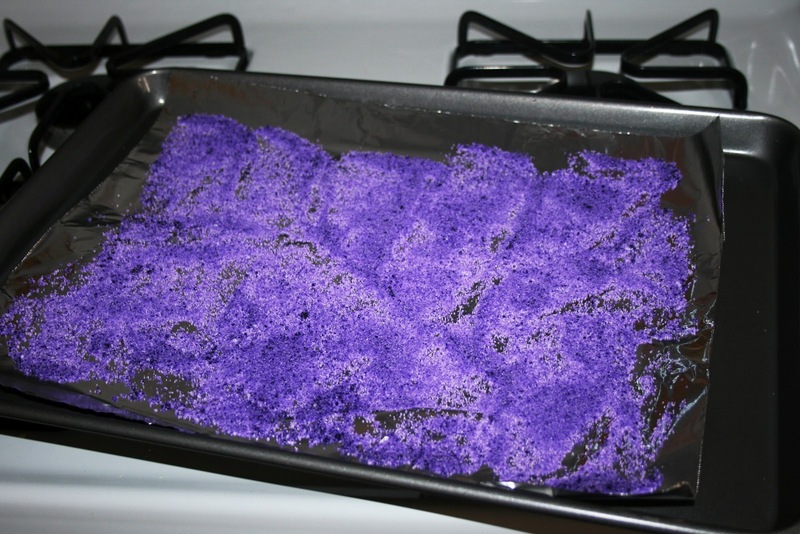 Allow the glitter to cool completely before you place it in your sprinkle containers. I've been saving old sprinkle containers from cooking spices for a little while now, so I had 4 to use. If you don't want to do that, you could always go buy salt and pepper shakers. Also, I added a few grains of rice into the containers with my glitter, just to absorb any possible moisture that may be left. To use, sprinkle on wet glue, and shake off excess. Fancy salt-rimmed margaritas! :) Oh yeah! You could also do this with sugar crystals!